The software development industry moves fast, and to keep ahead of the competition you have to stay on top of the trends. Atlassian sends a yearly survey to their large customer base in addition to developers not using Atlassian products, to see what has been changing, and to find out which new tools and techniques are being adopted in both large and small development teams in a variety of industries. You can sign up for Atlassian's 2016 survey results on their website. 2016 has seen even more rapid change than in previous years. 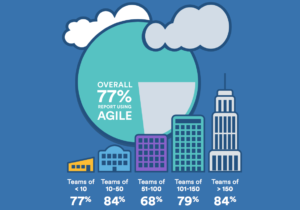 The vast majority of teams of all sizes now use agile development methods. Fast-paced collaboration and customer-driven iterative development makes it easy for developers to be productive, regularly and reliably shipping deliverables. Not as popular with small teams, Continuous Integration and Continuous Delivery supports frequent, short development cycles, and ensures a software product update can be released without a long testing phase. Larger teams, and in particular Atlassian software users prefer this method, in combination with agile development. Which version control system is most popular? A number of distributed version control systems are available, allowing developers to branch and code independently (reducing errors), and review each others' work. By far, Git has been the most widely adopted, with between 65% and 86% of survey responders now using it. These three tools and techniques seem to be a perfect fit for each other. The software industry agrees, with just under half of Atlassian's survey respondents using all three together. Containers appeared in the software development scene a few years ago, and are just now building traction. By containerizing an entire application platform and all of its dependencies, you can make software run reliably on a variety of computing platforms, independent of operating system and hardware. A third of all companies said they were already using containers, and half of the large teams with 150 developers or more, are using them, even though containers are one of the newest trends in software development. Small teams have been slower to adopt this technology, but will need to use it as more varied devices are developed. Large teams are leading the way in performing regular code reviews to optimize their code and reduce the need for long meetings. Companies needing to improve or maintain a high level of security, like banks and security firms, used this technique the most to ensure the quality of their software. Code reviews result in a more stable and secure product, and a higher level of customer satisfaction. Whether you are a small or large development team, we can help you improve your processes, provide you with Agile training, and support you with the latest tools for software development. Atlassian provides the best software development tools on the market, we are one of the largest Atlassian experts with the experience of hundreds of successful Atlassian projects under our belts. We are more than happy to support you — please send us your questions! Read the full 2016 Atlassian report on software development, trends and benchmarks (PDF).